Much of my time is spent talking about sustainability to people who think like I do. We have a great time discussing the problems and the needs as well as confirming our own beliefs and actions. As like-minded people often find each other, I imagine this is the case for many people dedicated to making a difference in creating a sustainable world. Real change will come when we can talk with others who don’t think like us. I’m surrounded with people in my workplace and community who don’t think about sustainability and don’t really know what the terms means. Talking with those who don’t yet embrace sustainability or have decided it is a “hoax” is important work we all need to develop the courage and skills to do. Skills lead to courage so my hope is that the following suggestions can help you develop some skill in this area. Recognize that our beliefs about sustainability are based on both facts we have interpreted as true and assumptions we have made. Often we lose sight that the same facts can result in different interpretations. When this happens, conversations become stalemated—we believe we are right and others are wrong. At moments like these, the Ladder of Inference—a communication tool offered by Peter Senge in his 1994’s The Fifth Discpline Fieldbook—can help us see how our thinking moves up the ladder to form our beliefs and inform our actions. When we learn to work with the ladder to track our own thinking, we are then better able to explain how we have come to the assumptions and beliefs we hold. We can also inquire as to how others have come to different assumptions and beliefs. Recognize and state our big assumptions that both drive and undermine our commitment to sustainability. In their 2001 book How the Way We Talk Can Change the Way We Work, authors Robert Kegan and Lisa Laskow Lahey define seven languages for transformation. The fourth language is moving from the truths that hold us to the assumptions we hold. Identifying the big assumptions that limit our ability to be effective change agents and social activists is the first step to unleashing commitment to action. A big assumption of mine is that I don’t have the time to. Engage disagreement as an learning opportunity. I doubt if many of us would say we like to find ourselves in disagreement. Yet, I have come to see those times as windows of opportunity to exploring my own assumptions and those of others. Disagreement can fuel a passionate conversation and can bring us together when we can engage it respectfully. The core of Marvin Brown’s internationally recognized work on the ethical decision making process is the ability to engage disagreement. The first step to avoiding the trap of agreeing to disagree, or avoiding conflict, is to change our mental model and view disagreement as an opening for learning. The second step is to learn how to effectively engage in dialogue. Learn the skills of dialogue. Although we use the term dialogue loosely, true dialogue is a practice that engages all of the aforementioned skills into a conversation that can transform. At the heart of dialogue is the intention to reach new understanding. This is quite different from the post office model of communication that we all learned, which focuses on the sending and decoding of messages to express our point of view. Dialogue requires us to balance advocating a point of view with inquiring about other perspectives. Learning through this process requires us to recognize and “suspend” our assumptions, or we might say put them at risk, by asking: “What if that assumption is not true?” We can also explore the assumptions of others by considering the assumptions we would need to hold to have the same understanding the other person. My colleague Marvin Brown is known for a very powerful statement, which I repeat often: “MOST PEOPLE DO WHAT THEY THINK IS RIGHT GIVEN THE WORLD THEY THINK THEY LIVE IN.” Co-creating a sustainable world requires that we understand and engage different perspectives, values, and experiences to support our own learning and that of others. 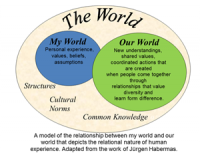 We each need to better understand and communicate our My World perspective and understand how it has been shaped by our unique experiences and interpretations of the society and the broader world. Only then can we collectively create Our World—a world that supports all of us and future generations in healthy social systems on a sustainable planet.